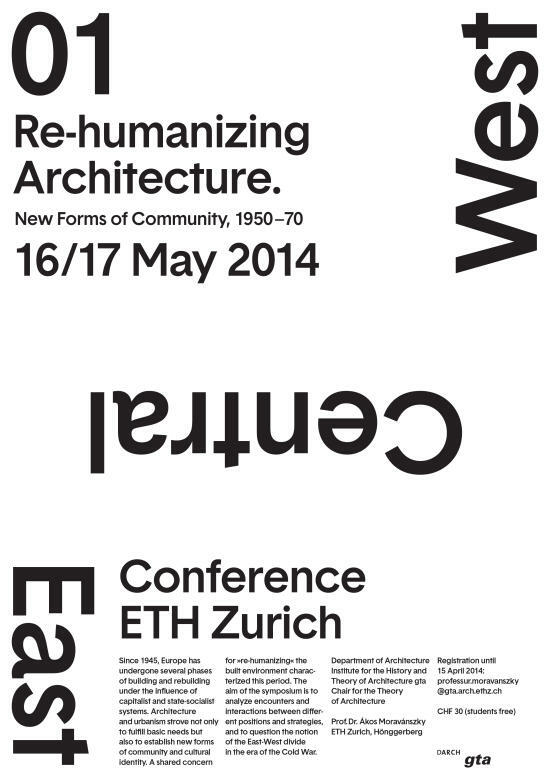 The two-day international conference ‘Re-humanizing Architecture: New Forms of Community 1950-1970’ will open a forum for current research in the history of architecture and urbanism in Europe aiming to produce a new comparative picture of architectural transfer and competition in the early period of the continent's political divide. Since the end of World War II, Europe has undergone several phases of building and re-building under the influence of different political systems and, connected to these systems, different ideas concerning the built environment and its production. State-socialist countries and capitalist welfare states alike enlisted architecture and urbanism in the organization of new social and economic environments not only to meet basic needs, but to establish new forms of community and cultural identity. While the two systems initially embraced ideological and aesthetic difference, discourses that emphasized the functional and rational aspects of modern architecture became characteristic for economic recovery on both sides since the late 1950s. Nevertheless, across Europe protagonists such as Team X urged for a re-establishment of traditional and regional patterns in order to "humanize" environmental design. They proposed new forms of community, criticizing functionalist principles of urbanism as propagated by the CIAM. The conference addresses the question how different actors (architects, theorists and intellectuals, public planning institutions, and others) have developed concepts, strategies, and models to meet human needs in modern industrialized societies. By placing them in the context of intellectual debates around New Humanism, aesthetic concepts such as (Socialist) Realism and philosophical currents like Existentialism we seek to re-assess the role of alternative discourses and spatial concepts about the forms of community in post-war modernization processes. To attend this conference, please register by sending an email to professur.moravanszky@gta.arch.ethz.ch. The conference fee of CHF 30 should be paid upon arrival. The fee includes morning and afternoon coffee, the program and book of abstracts. Students are free to attend but asked to register, since seats are limited.